The high school football game between Staples High School and Danbury High School at Staples in Westport, Friday, Oct. 18, 2013. Having won three of the last four FCIAC championships, the Staples football team rarely goes into a conference game as a significant underdog. Squaring off against the one of the top teams in the state -- New Canaan Friday -- places the Wreckers in that role for the first time in a while. "We're just going to go out and play whether we are favored or not favored," Staples coach Marce Petroccio said. "We're not used to being underdogs; for this game we definitely are. That's fine with us; we're just going to play our tails off and try to win." Toppling the Rams (6-0) will likely require the best performance of the season by the Wreckers. New Canaan opened the eyes of the state with a 66-20 win over Greenwich Sept. 28. 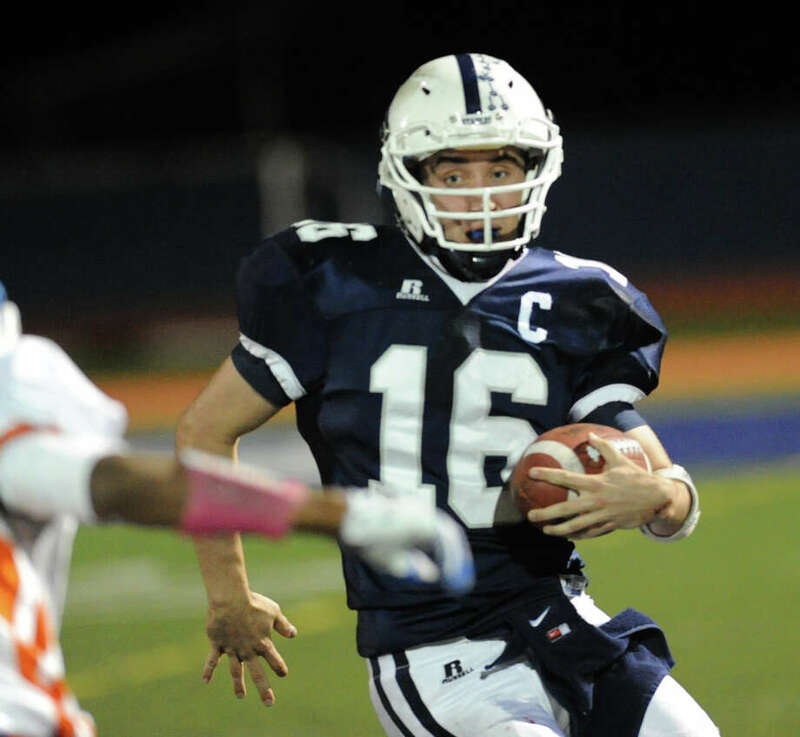 New Canaan averages 50 points per-game and is led by quarterback Nick Cascione. The senior has thrown 18 touchdowns to just one interception in six games. "Offensively they are dynamic," Petroccio said. "They have a lot of ways to beat you; they spread the field and have athletes everywhere and they are huge up front. Defensively they really come after you; no one has really moved the ball on them." While it hasn't been the rosiest start to the season for the Wreckers (5-1), they find themselves right in the thick of the race at the midway point. Staples fell 30-22 to then No. 1 ranked Xavier in the season opener before reeling off five straight wins against FCIAC competition. "It's kind of a good news, bad news deal," Petroccio said. "The bad news is that we've been inconsistent. There has been times where we played great football and times and we are awful. On top of all of that, we're still 5-1. We've played some good football teams and this will be another." The last time the two teams met was Sept. 25, 2008 a 21-20 loss to a Rams team that would eventually go 13-0 and win a FCIAC and state championship. Staples is 48-6 since the start of 2009 while New Canaan is 48-8. "I remember every play from that game," Petroccio recalls. "The fact that we missed an extra point, that we turned it over on the 14-yard line on a play we thought that would work. We've always had great games with New Canaan." The duo of Patrick Lesch and Jack Greenwald has been the catalyst to an explosive offense that has shown flashes of being as dominant as offenses in years gone by. The Wreckers average 40.5 points per-game. "The play of the offensive in its entirety has been better than what we expected," Petroccio said. "We have some guys come out and do a great job for us, all four captains -- (Lesch, QB Jack Massie, OL Nick Ward and WR/DB Will Johnson) -- have had a good year." With many of the top weapons absent from last season's 10-1 team, senior Massie has taken on an even more important role in the offense. A three-year starter that truly personifies the term `dual-threat,' Massie has thrown for nine touchdowns and ran for five this season. "He is their go to guy," Rams coach Lou Marinelli said. "He is the straw that stirs the drink. He is very quick and elusive and they run a nice package of plays for him... I know that as a three-year starter that this game is everything for him." The Staples defense has been inconsistent at times, excelling in a hard-fought 14-7 over Wilton while struggling away to put away opponents in Ludlowe and Danbury. "We just have to shore up our defense a little and stop people," Petroccio said. "If we can do that we will be fine." Not only is the game a battle between two of the best teams in the conference, but two of the best coaches in the state as well. Petroccio and Marinelli have combined for 471 wins in 54 combined seasons at their respective schools. "(Petroccio) and I have come to really know each other and I respect him greatly," Marinelli said. "They are as well a coached team there is anywhere, not just in Connecticut. He has dedicated his life to that program. They are well coached and very sound on both sides of the ball. Marce has brought this program to great heights."